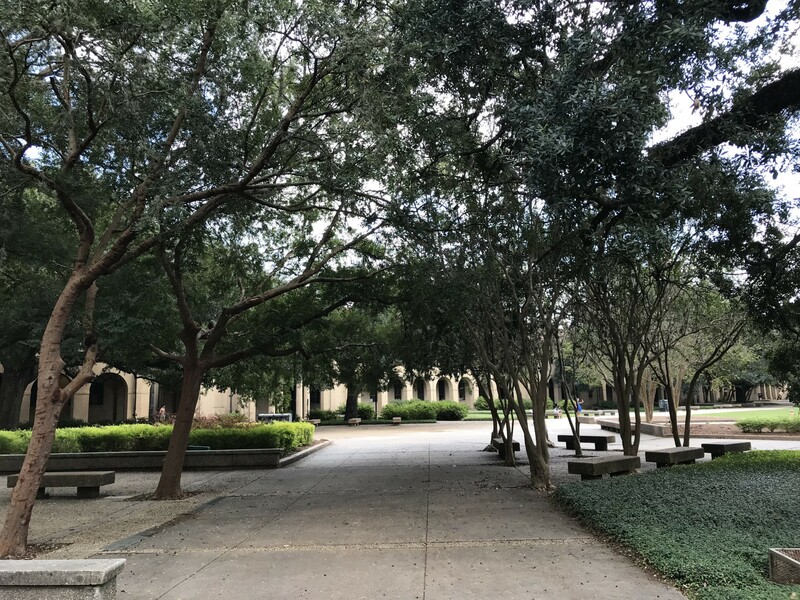 LSU campus, 2018. Image courtesy of Stacy Platt. Why go to a Society for Photographic Education’s chapter conference? Isn’t the annual conference enough? With resources both material and immaterial stretched thin to non-existent, how can we justify another conference — another SPE conference at that — to ourselves, our schedules and our bank accounts, all in the same year? What could I possibly gain from the chapter conference that appreciably different enough or beneficial from the the big annual conference in the spring? 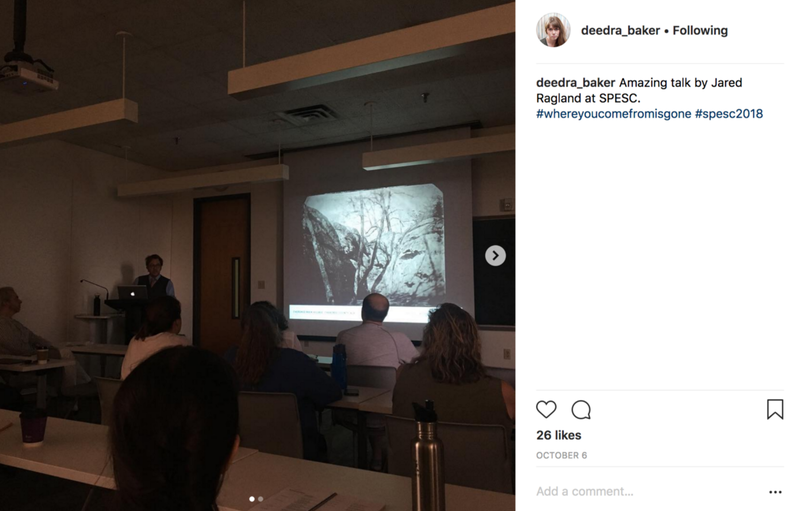 For the past three years I have been taking it upon myself to attend a different SPE chapter’s fall conference: in 2016 I was in Tucson, AZ for my home chapter’s conference “Hunting and Gathering: Trends in Photobooks and Image Archives,” in 2017 I went to the NE conference in Brattleboro, VT “Is Photography Enough? 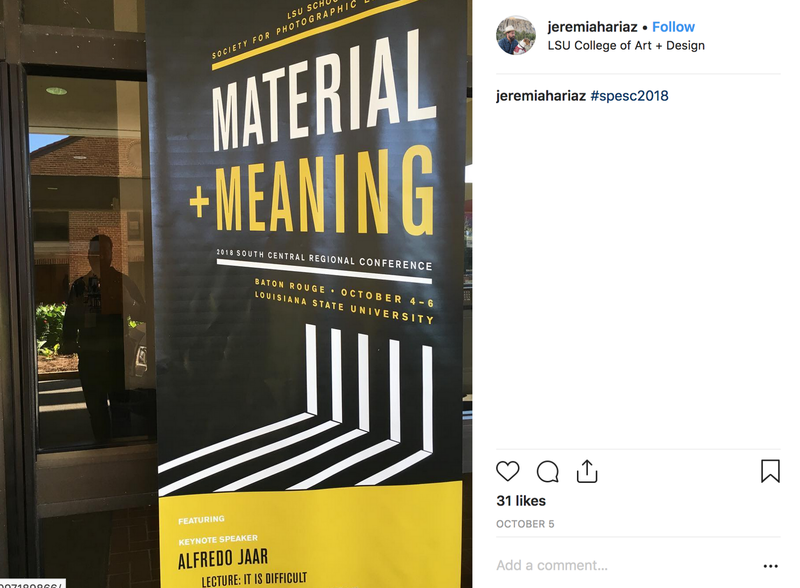 Interdisciplinary Approaches Beyond the Still Image,” and this year I crashed the party at the SC conference “Material + Meaning,” held at LSU in Baton Rouge, LA. As editor of this magazine and a member of the home-team staff, I have broadened my definition of “my chapter” to include all eight continental U.S. chapters. 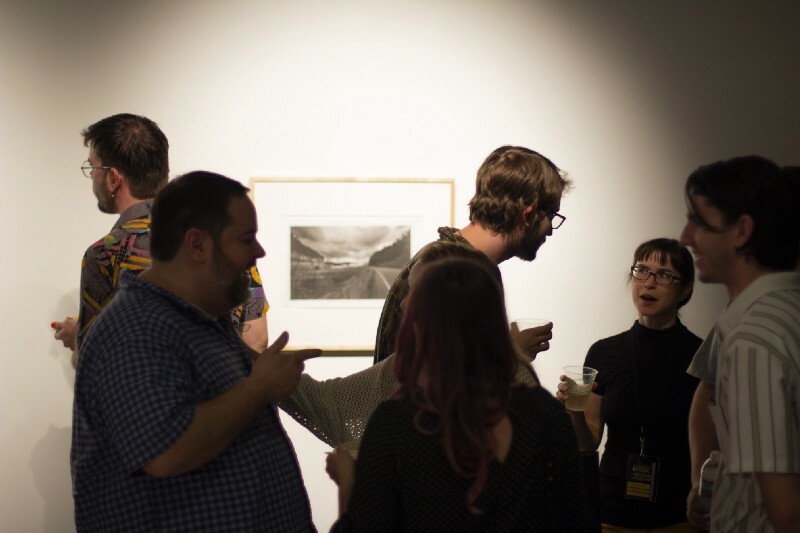 I go to these events to have a better, more intimate sense of the character and concerns of each piece of the SPE pie, and to build relationships and be exposed to the work of the educators, students, and other makers there. 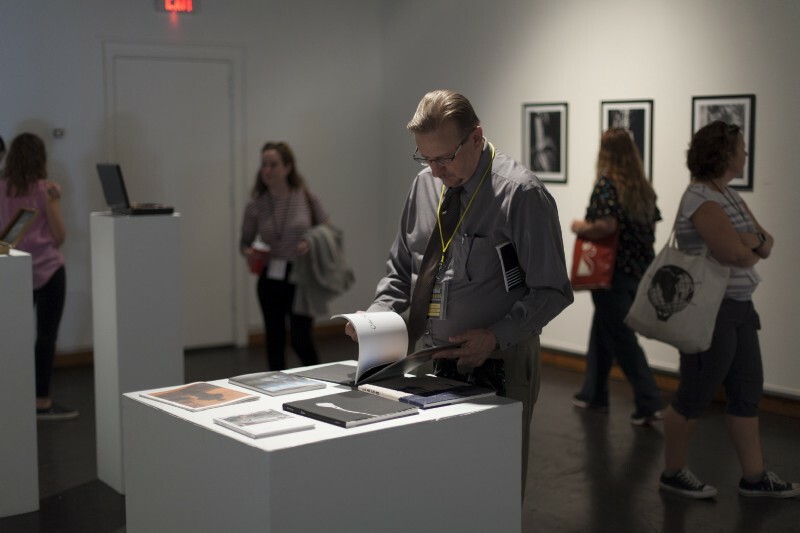 It has also been an excellent sounding board for encountering and engaging with student groups, student interests, and the state of arts and photographic education from their point-of-view, in a manner that is less chaotic and somehow more personal than at the annual, all-chapter event in the spring. image courtesy of University of Tulsa Photo Club and #spesc2018. As an editor, I am also at these conferences in the hopes of finding interesting scholarship, research, bodies of completed or ongoing work, and current conversations that would be of relevance and significance to those that only encounter SPE through the annual conference, through our social media feeds, or even solely through this publication. These various and varied geographic encounters have yielded several in-depth pieces that we’ve published since Exposure’s move to an online publication in the fall of 2017: interviews between conceptual photographers Mishka Henner and Jason Lazarus, as well as de-mythologizing the work of photographer E.J. Bellocq, came out of the 2016 Southwest/West Tucson conference. “Problem Solve Like an Artist,” a feature on the work and activities of Jordanna Kalman, came directly out of my hearing her talk in Brattleboro, VT. And I can say with much assurance that there were several talks and bodies of work that I was exposed to for the first time at LSU this fall that will find their ways into Exposure over the course of the year. Image courtesy of Jeremiah Ariaz and #spesc2018. Material + Meaning brings together shared thematic concerns at the forefront of contemporary photographic practices. The widespread exploration of the aesthetic and physical possibilities of photography points toward a renewed understanding of the photograph as material object. We are interested in putting these investigations of the tactile and tangible in conversation with the harder-to-pin- down social and political concerns of our time. What can photography help us understand about power, truth, transparency, and reliability? We look to artists who synthesize materiality and meaning to act as stewards of interpretation and representation — -framing and shaping visual culture and politics. We hope this conference will provide a platform for us to connect and reflect on these themes within our region and beyond. The conference committee is to be commended for programming a weekend that really pushed all of the edges possible in “Material + Meaning.” While I could not be in two places at once and only heard half of the featured panels and speakers, I was astounded by the breadth of the committee’s selection that covered everything from photograph as object, as performance, as protest, as poem. Particular highlights included Aaron Hegert’s presentation on very D.I.Y. 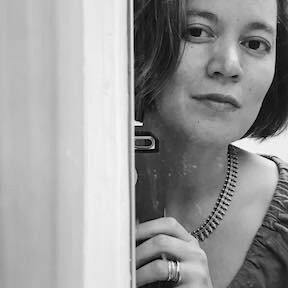 self-publishing and the E.I.C. book collective; Diane Durant’s playful investigations into the limits of what can be seen and understood as photography via text-based contact prints and installations that are characterized by an absence of image and an absence of object; Rana Young’s collaborations that seem ostensibly within the realm of portraiture, but really address the notion of every portrait being a profound kind of self portrait of the photographer; and Jared Ragland’s talk on how his experiences as the Obama administration’s White House photo editor has informed and set in motion his current body of work investigating the history of memory both personal and collective through wet-plate images of locations in his native south that challenge us to view them beyond our predilection of placing them within a 19th century, civil war or reconstruction paradigm, and see the history behind the history of these places. 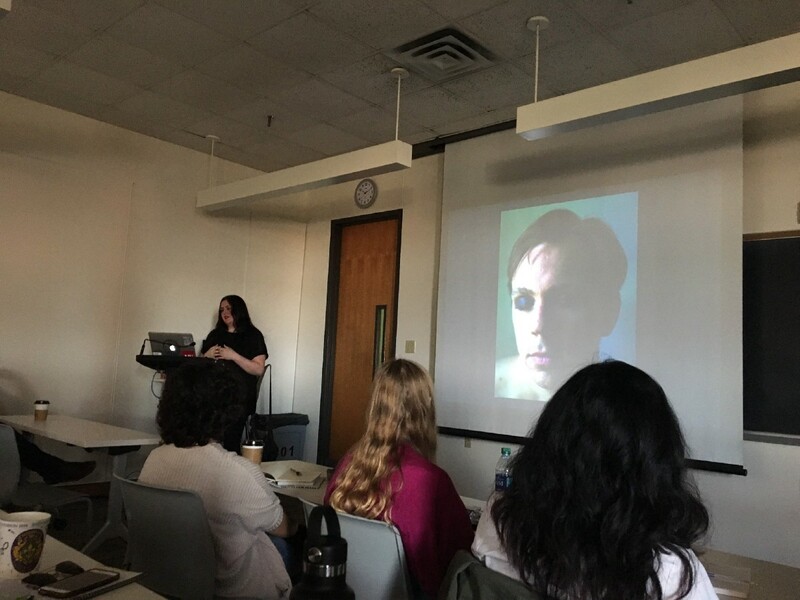 (from l-r: Rana Young’s presentation, image courtesy of Victoria Vontz; Jared Ragland’s presentation, image courtesy of Deedra Baker and #spesc2018. Image courtesy of Alfredo Jaar. In total honesty, the first reason I decided to attend the South Central conference was because of who they were fortunate enough to land as their keynote speaker. 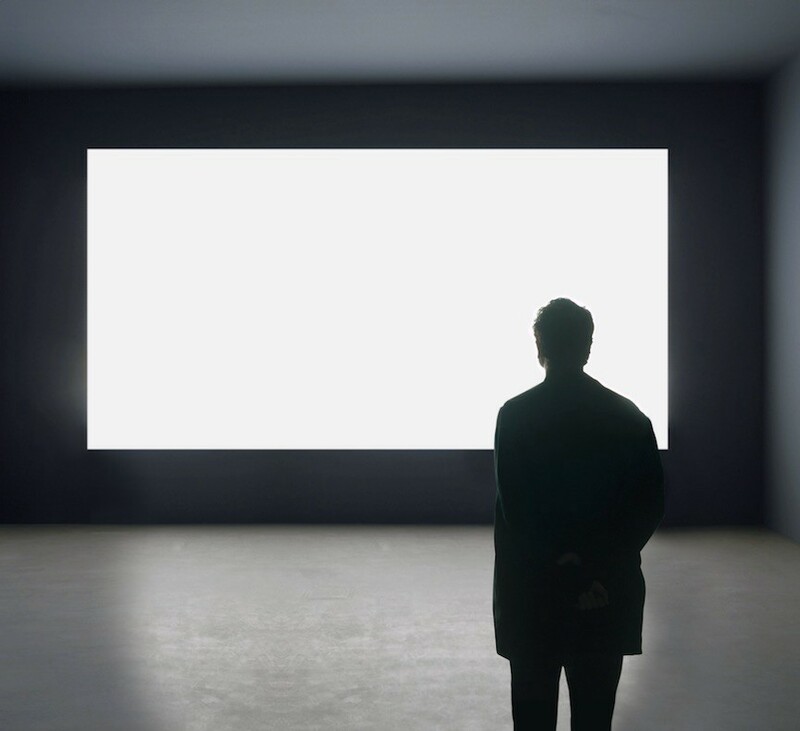 Alfredo Jaar is possibly one of the most philosophically conscientious and daring artists working today that addresses the most wrenching, pressing issues of our times through his art installations and interventions. I don’t know if there was any other manner than through his talk that I would have learned the amount of research, collaboration and immersion that Jaar invests in each of his projects. I was dumbstruck at how he was able to receive continuous offers of commissions for cities in which he often holds up a mirror to the public of the most grievous shame their city has willfully ignored as the source material for his piece. 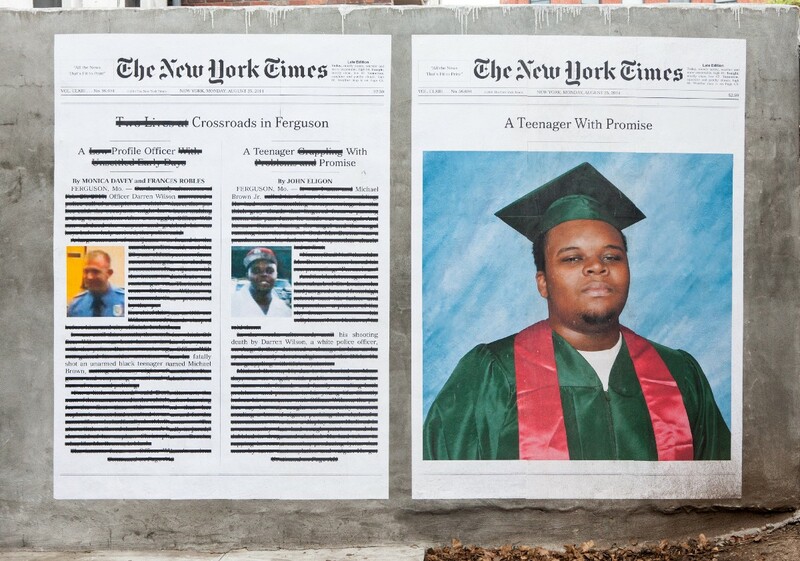 How does he keep getting invited to make these fantastic pieces designed to invoke a sense of penance and an urge for reform in place to place? In a piece that was commissioned for the city of Helsinki, the work consisted of a room of 1,000,000 Finnish passports behind security glass that was burned after the exhibition’s term. The passports represented Finland’s inflexible immigration policy, the most severe of any EU nation. Less than 5% of the country’s inhabitants were born on foreign soil, compared to the normative 20% of every other EU country. If Finland had a commensurate policy, there would have been approximately 1,000,000 foreign-born nationals living there. The passports represented lives not led because of xenophobic politics. 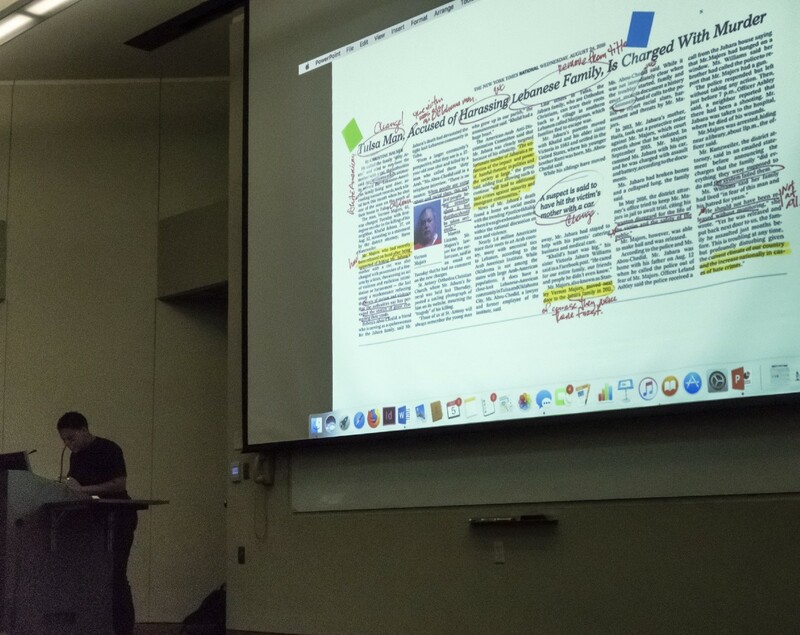 (from l-r): “A Teenager With Promise,” image courtesy of Alexandra Bell; Alexandra Bell’s keynote, image courtesy of Arden McMillin. 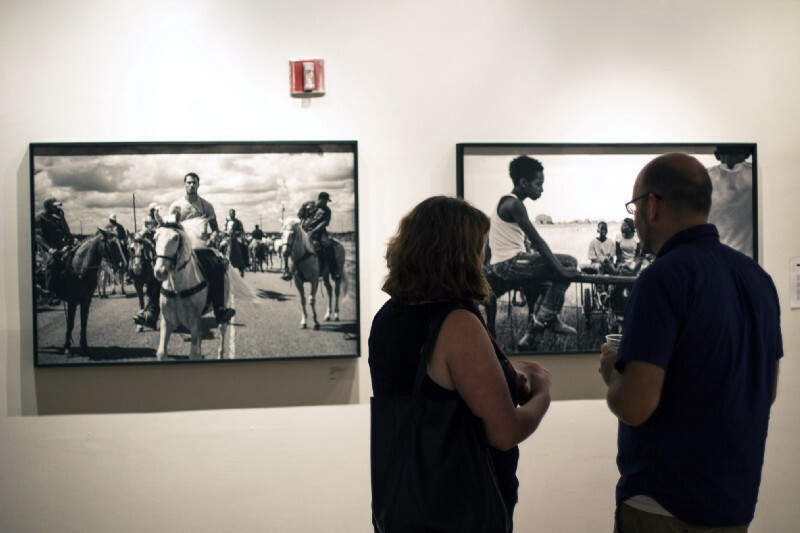 Over two days, there were FIVE photo exhibitions to take in: a student pin-up show, an educator’s show, an LSU alumni show, a curated show on landscapes/sites, and finally Carrie Mae Weems and Jerry Uelsmann at the LSU Museum of art in the Shaw Center for the Arts, whose work also addressed the themes of the conference. Shows were held both on campus as well as within the city center, and they all of the events organized to exacting standards meant to maximize the contemplation of the work and camaraderie of the openings. (from l-r): Educator’s exhibition, image courtesy of Micah Viccinelli; Glassell Gallery reception, image courtesy of Micah Viccinelli; Alumni exhibition, image courtesy of Efran Ghiasi. LSU was a gracious host sponsor, providing an easy home for all of the panels and talks to be conducted, for offering up the Shaw Center for the Arts as a venue for the keynote, and finally, for subsidizing the cost of bringing one of the greatest living artists working across the conference theme to speak as the keynote, Alfredo Jaar. Aside from the dumbfounding discovery that there is an actual, live 800-lb Bengal tiger residing in public view on LSU’s campus (!!! ), the most rewarding finding of my time in Baton Rouge was that regions are a state of mind, and one can find all of the fellowship, stimulating scholarship, and artful inspiration that is a hallmark of the SPE community, in any context and in any place. Image provided by Stacy Platt.